February 12, 2019 – Scotch Whisky exports set new records during 2018, according to statistics released today by HM Revenue & Customs. The export value of all Scotch Whisky exports during the year reached £4.7 billion GBP ($6.057 billion USD), a 7.8 percent gain from the previous record set in 2017. In addition, the volume of exports also set a new record with the equivalent of 1.28 billion 70cl bottles, up 3.6 percent from 2017 and breaking the previous high of 1.26 bottles set in 2011. “If you take market by market, there’s some important growth as well,” said Graeme Littlejohn of the Scotch Whisky Association. The United States continued to be the most important single export market for the Scotch Whisky industry, and became the first-ever “billion pound” export market in 2018 with a 12.8 percent increase in export value to £1.04 billion GBP ($1.8 billion USD). The U.S. also remains the second-largest market by volume at 127.5 million bottles (70cl equivalent) behind France, which continues to lead the world at 178.4 million bottles. The difference is generally attributed to more “value-priced” bottles being exported to the French market, while the need to bottle whiskies in 75cl bottles for the U.S. market makes it more economically practical to export higher-priced whiskies to America. 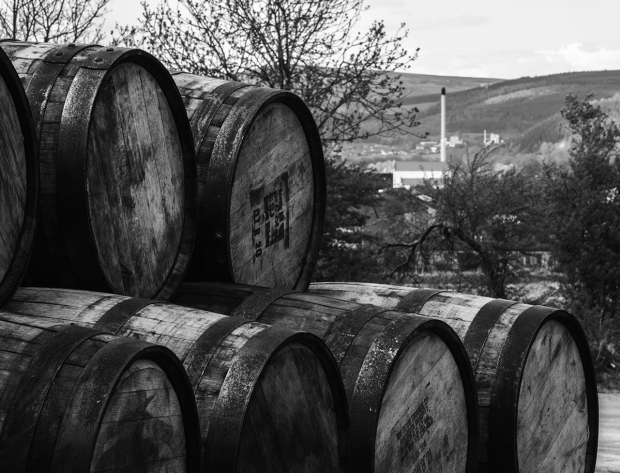 “The underlying strength of the Scotch Whisky industry is at the heart of this,” Littlejohn said in a telephone interview following the annual release from HMRC. “There’s a growing trend for premiumisation across spirits – that’s not just involving Scotch Whisky, of course, it’s across all spirit categories, but there’s demand for Scotch Whisky growing in some developing markets across the world,” he said. Among those markets, India was a surprise with significant gains in both volume and value. Littlejohn noted the gains came despite India’s 150 percent import tariff India charges on imported whiskies, but said the trade association’s economists will need some time to analyze the government data before coming to specific conclusions on the gains in India and other countries. 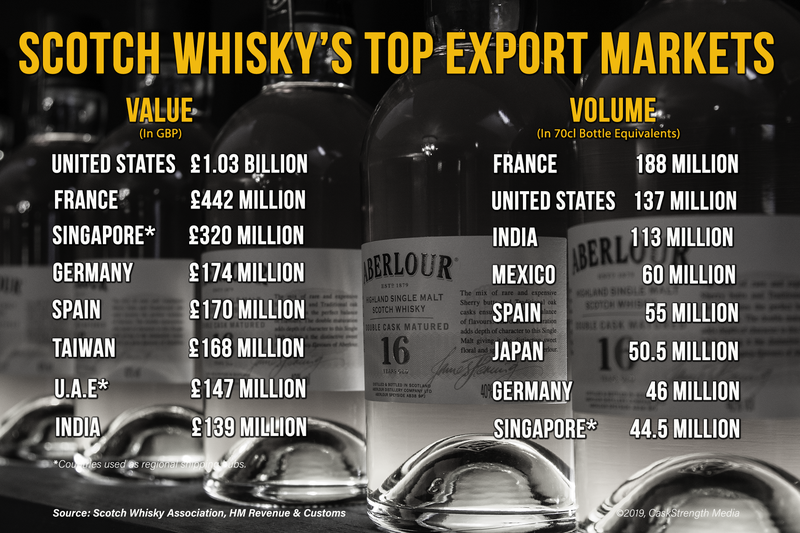 On a regional basis, the European Union remains the largest market for Scotch Whisky exports. With Great Britain still scheduled to depart the EU on March 29 and no final agreement on their future relationship in place, the SWA is calling on UK officials and their counterparts in Brussels to agree on an “open and positive” future relationship with “frictionless” trade. “The EU is still our biggest regional market with 30 percent of Scotch Whisky by value going to EU countries, 36 percent by volume with France being the number one market in the world by volume again…it’s important that we get some clarity around Brexit so that we can continue to improve on some very strong numbers in exports last year,” Littlejohn said. Scottish Rural Economy Secretary Fergus Ewing praised the 2018 results while calling for support to protect the whisky industry as the Brexit date approaches. “It’s an industry that, despite having been established for centuries, has still gone from strength to strength in recent years, thanks in part to the determination from the Scottish Government and the industry to work together, in order to create a national brand with a global reputation. Thanks to that success abroad, Whisky is a major employer in Scotland. Of course Brexit continues to threaten that progress, particularly in relation to the European market which accounts for 30% of our exports. But we are doing what we can to support the sector against growing uncertainty, and ensure it remains one of the biggest contributors to Scotland’s economy,” he said in a statement.